The rustic chic of this unisex nightstand will delight moms who prefer the more classic style! We love the warm finish and details on the kick plate and drawers. And if your child lives at home until the age of 30 (not something we would necessarily wish on you! ), the timeless style of this furniture means you can hold on to it forever. Wooden knob. Features 1 open easy-access storage space. Features 1 practical drawer. Metal drawer slides. Drawer dimensions #1: 17.875'' (L) x 13.625'' (D) x 4.375'' (H). Meets or exceeds all North American safety standards. Accessories not included. Requires complete assembly by 2 adults (tools not included). 17'' (W) x 20.25'' (D) x 24.87'' (H). Box dimensions: 30.24'' (L) x 18.31'' (W) x 4.69'' (H), 39 lb. Packaging tested and certified to reduce the risk of damage during shipment. Made in North America with non-toxic laminated particleboard. 5-year quality guarantee. Any questions? Contact South Shore, the manufacturer, available 7/7 by phone, email or chat. 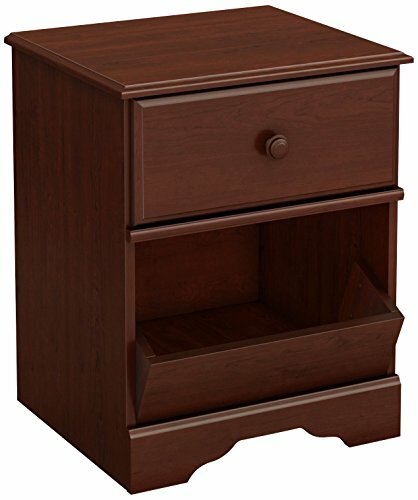 LIFESTYLE FURNITURE: The nightstand's 2 deep drawers are finished with a convenient open storage compartment for books above. Featuring grooves on the drawer fronts and molding on the front and sides adds up to this nightstand's charm.